Also known as gliding windows, the streamlined sliding window has at least one sash that glides horizontally to reveal the bright and beautiful outside world. Easy to open and low maintenance, these windows are a popular along walkways or porches and ideal for any space where there isn't room for the windows to open outward. Sliding windows are comprised of a single frame and pane of glass. However, what makes the sliding window truly unique is the way that it opens. A sliding window slides open and closed on rollers set in a track. A sliding window is often strategically used for cramped areas of the home, or for rooms where a large exterior obstacle such as a tree or another building blocks the window's ability to open outward. 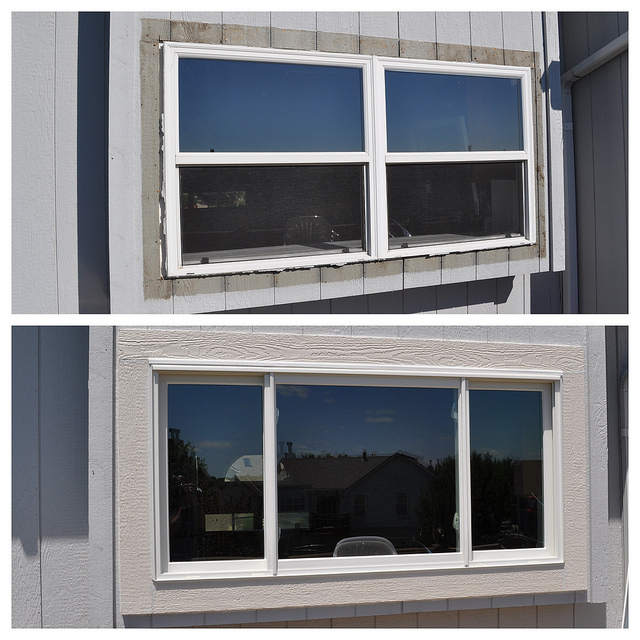 Read on to learn more about the various pros and cons of the sliding window. The sliding window is no longer as common as other window styles available today. The complexity of multiple sashes makes the sliding window slightly more expensive than other windows. A sliding window typically costs between $250 and $950 per window. Sliding window installation costs are generally an additional $75 to $250 per unit. The sliding window's design varies. A sliding window can have as many as three operable windows that open to the great outdoors. However, the primary types of sliding window are the double and single-slider. A common choice for kitchens, a double-sliding window has sashes which open from each end and glide along the window frame with ease, making the slider window extremely easy to open. A single-sliding window has one fixed window and one sliding window. Although this option does not allow as much ventilation into your rooms, it is much cheaper than the double-sliding window, since it has only one window that slides. The sliding window has fewer parts than traditional window types. This is makes it a durable and low-maintenance choice. While pulleys or springs eventually fail over time, the simple and easy-to care-for sliding window's rollers make it far more durable, especially when combined with other additions like window glazing. However, the sliding window's exterior is somewhat harder to clean, repair, or replace; unlike other windows that are able to tilt and be cleaned from the interior, the sliding window only moves left and right. While the sliding window is preferable for its ease-of-use, it is not able to provide as tight a seal as the casement window, which is similar in style. Consequently, normal U-factor (the insulation value) for a sliding window is around 0.18. Sliding windows' SGHC (solar heat gain coefficient) values fall somewhere between 0.19 and 0.23. Homeowners should note that the lower these values are, the better the window's seal and the more insulation their window provides. A sliding window is perfect for situations that call for a window that slides left or right rather than opening outwards. This type of window is an especially good choice for rooms that open onto porches, outside walkways, or other areas where a window that opens outward would be cumbersome. Extremely easy to use, a sliding window is a durable and low-maintenance option.